Mobile game finds a slightly difficulty to match with racing genre, but not for CSR Racing 2 APK 1.5.0. Player can drive and control car movement smoothly. This game has attractive interface and graphic that resembles real car and city. Since you will go for drag race, no circuit will be displayed. Drag race held at street. 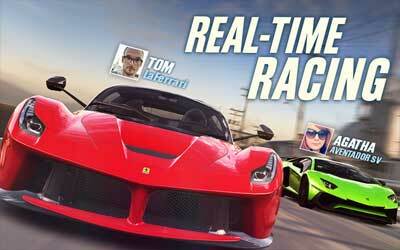 This game delivers new experience of racing in your own hand. Several features from CSR racing 2 will be explained in the next paragraph. Ton of supercars are available for player to drive. You surely recognize them because this game takes popular supercar in real life. There are Lamborghini, Ferrari, Bugatti, Pagani, etc. Each of players can select the car then build into dreamed car. Customization is applied on trims, brake, wheels, engine, interior, and color. To find suitable material for this process, player should obtain enough money to buy at online store. Another way to improve car capability is tune engine. It takes time to upgrade car, particularly for beginner. After the car is ready, player can challenge others to drag the race. Basically, this game requires internet connection to assist player find live challengers. Five players are able to participate in single racing. Winner will receive reward and point. Besides being a racer, you might want to be crew of your friend. This game allows player to pick others and form the team to build ultimate car. As it mentioned above, internet is essential because you cannot join team without live mode. The advantage of the team is you will have much resource, sharing expertise, and it is more efficient than individual racer. In team, probability for winning race is bigger and racer does not have to worry about improvement. You just need to focus on racing. This game comes in 3D. If you are rookie, challenge the top racer in city. CSR racing 2 for android is recommended game for your smartphone. For the first time on mobile, CSR2 presents the world’s most powerful, fastest, and most exclusive production super sports car: The Bugatti Chiron. We are introducing new rewards and tweaking the match making system in Live Races to take your racing to the next level!